Exclusive Villa With Swimming Pool,.....Second Line Beach. The exclusive Villa El Messidor, with its own swimming pool, large garden and tropical plants is pleasantly situated next to the Puerto Banus, and in the second line Beach in the smart residential La Pepina/Azalea beach area. It is only a -minute walk from the beach (60 meters), and within a short walking distance to hotels, bars, restaurants, and a supermarket. Puerto Banus with its restaurants and nightlife is within 10 to 15 minutes walk and the pleasant, white washed Andalusian town of San Pedro is only within a three-minute drive. Several golf courses lie minutes away by car. The large, comfortable Living room has two seating areas as well as a fireplace, Separate dining room. Both rooms have double doors to the arched terrace overlooking the pool and garden. The villa is located within 5 minutes walk to CoCo Beach and Mistral (no stress) Beach in Puerto Banus and their respective recreation and sport facilities. The Kala-Kalua water sport facilities (with jet skiing, pedal boats, para-sailing, and banana boats) and San Pedro fine beaches are within five minutes walk in another direction. The two well known and exquisite beach-side fish restaurants in the entire Marbella (Nueve Reino and Alabardero) and many other fine restaurants on the San Pedro promenade are within a very short walking distance. The Hotels Cortijo Balnco, Nueva Andalus, Reinicon Andulus and all their facilities are within a very short walking distance. Points of Interest: There are numerous places of historical interest nearby. The Moorish city of Granada with Its Alhambra Palace and gardens, one of the most brilliant jewels of universal architecture is approximately 1.5 hours drive. The old City of Ronda is within 45 minutes drive. Gibraltar is within one hour drive. The Costa del Sol is at the forefront of Europe for sailing with its excellent marinas and invaluable berthing capacities, these include Puerto Banus, Marbella, Estepona, Duguesa, etc. There are a number of tennis clubs as well as many excellent health and gym centres in the Marbella area. Europe's sunniest ski resort, the Sol y Nieve in the Sierra Nevada, host of the 1996 'world Ski Championships' can be reached in two hours. Puerto Banus: Since its inception some forty years ago, this port has steadily grown and now features a casino, commercial shopping centre, a Corte Ingles department store, marine observatory and a multi cinema with films shown in their original soundtrack. Nightlife buzzes at Puerto Banus with your choice of alfresco bars, piano clubs and discos while during the day this is a window shoppers dream with several of the world renowned fashions houses featured here, in addition to small, interesting shops and boutiques. If you really want to have a bird’s eye view of the port’s magnificent position, then regular boat trips are the ideal solution and available on a regular basis from the central promenade. This is the place to be pampered yacht side and ogle those fabulous luxury yachts while sipping a drink at one of the many open air restaurants and bars. The setting is close to ideal, with its impressive mountain backdrop and ocean views. The Villa has 350 square meters building with a land/garden of 1000 square meters. The Villa is equipped to accommodate 8-10 guests in four spacious bedrooms. The master suite has a double bed as well as a sofa bed for two and a very large en suite bathroom with an extra shower. The second bedroom has twin beds with en suite bathroom. The other two bedrooms have twin beds and one separate bathroom. The large, comfortable living room has two seating areas with sofa and sofa beds as well as a fireplace, which connects to a separate dining room. Both rooms have double doors to the arched terrace overlooking the pool and garden. It has a large well-equipped kitchen with a seating area. The Villa has a large L shape floodlit swimming pool, a built-in barbecue, floodlit terraces, and garden furniture. Weekly linen change, maids service twice weekly, and regular garden/pool maintenance are provided. Extra cots are also available. On Sept 5th 2010 my partner and I were one of four couples that stayed in Villa el Messidor. Our entire experience was delightful. The owners representative met us at the villa upon our arrival and was very pleasant and helpful. She showed us the villa, answered all of our questions, helped us set up our internet and provided her mobile number and advised if we needed anything to ring her. We found the accomodation to be clean and very well equippend. The four large bedrooms were a welcome find for four couples. Two were ensuite and the other two shared a common bathroom and toilet area. All of the living areas including the dining, kitchen and living room were very nice and more than met our needs. We prepared quite a few of our meals during our stay and found the facilities to be adequately equipped. We wanted for nothing during our meal preparations. Outside where we spent most of our time when not asleep was brilliant. The pool was lovely and the back garden was wonderfully flowered and landscaped. There was a covered back garden dining area that seated all of us and made for a very pleasent place to dine and socialize . There was an outdoor cooking bbq which was not the greatest but met our hopes of being able to cook outdoors. There were more outdoor lounge bed/chairs than the 8 of us required which made for a lovely place to enjoy the sun. 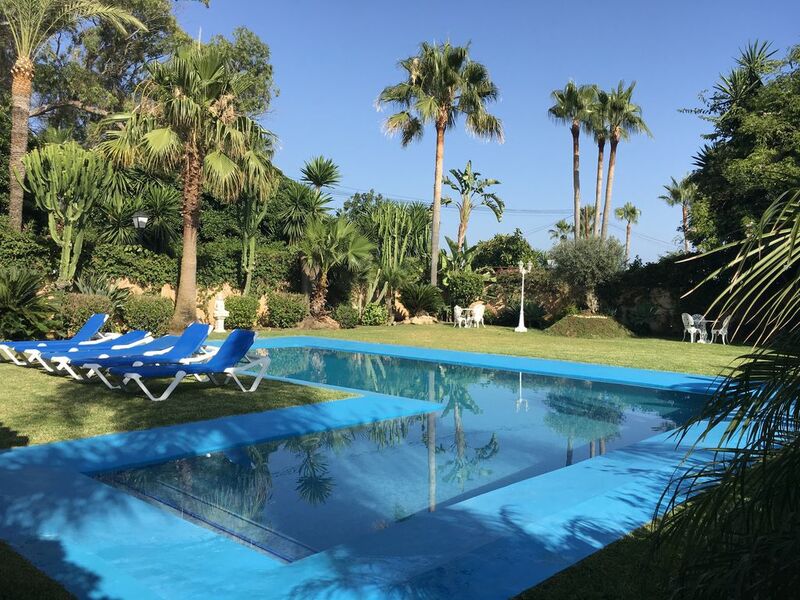 We were not overly impressed by the beach as there was not a good sandy area to lay but the pool and lovely gardens of the villa more than met our expectations without dissappointment. There is a nice boardwalk area on the beach a short stroll away with a very nice beach bar and some restaurants. The villa, pool and grounds were all clean and well kept. Mid week of our stay the gardner, pool keeper & villa cleaners came cleaned, changed the linen, cleaned the pool and mowed the already manicured grass. When we left we were running one hour late but the owners representative was very accomodating and returned one hour later. We broke two small wine glasses which we informed the representative of during the inventory. She told us not to worry about it and provided our full security deposit refund to us when we were checking out of the villa. Dr Ezzati (the owner) was very accomdating and responsive to us when we were arranging our stay. All of the guests (all four couples) would like to thank the owner and the representative (Gerlinda) for such a wonderful stay. THANK YOU BOTH. When we arrived the villa was filthy. The whole place was generally dirty but especially the kitchens and bathrooms. The kitchen was covered in food, crumbs and stains all over the work tops and the fridge was filthy and stunk of fish. The coffee table in the lounge had a dirty pair of underpants on it! The owner’s representative agreed to clean it properly but when we returned three hours later it was still dirty and the representative had left giving us no alternative but to spend the next two hours cleaning the place properly. The inventory was wildly inaccurate and many things listed were broken or not present. We went the whole two weeks without a toilet seat in one of the bathrooms despite reporting it on arrival. Whilst the pool was large it was, from the start, not clean. We had to clean it ourselves as the representative did not come, however it eventually became covered in green algae as a result of having insufficient chlorine. This meant we lost use of the pool for one full day of the holiday. The owner’s representative was totally inefficient. We had to request the clean linen that we had been promised after one week and the mid-week clean never materialised. The villa is located in a slightly shabby residential area. By car it is 2.5 KM to Puerto Banus. It is possible to walk to PB along a dirt track and the beach but this route is 1.8 KM and not very pleasant as you end up with shoes full of sand. You could not walk to PB in a “leisurely 10/15 minute stroll” as stated in the property listing. Walking at a brisk pace wearing running trainers took 20 minutes and at a leisurely pace took over 30 mins. The property is 100m from the beach however it is a mixture of dust and large rocks, used as a dog toilet and not suitable for any kind of beach activities. It is mostly used by the locals to drive across as a ‘rat run’ to avoid the pain of endless circuits of the A7. Our stay at Villa El Messidor was very disappointing. It was fantastic to have so much space and a very large pool all to ourselves but the dilapidated state of the villa and the location were a big let down. It is simply not worth the amoyunt of rental charged we paid. We would not recommend this property, or in fact the general area. There are far nicer places to spend two weeks for that kind of money. If you really enjoy people watching go to St Tropez as it's far better than Puerto Banus. The guests arrived earlier than expected while the cleaning crew was preparing the Villa after the departure of the outgoing guests. Subsequently, the incoming guests inspected the villa and controlled its inventory to their satisfaction and then received the keys to the Villa. Later in the day we received a telephone call from the guest that the Villa was not adequately cleaned. Despite the fact that the guests had inspected the villa to their satisfaction while the cleaning crew was present at the Villa, our representative was instructed to go back to the Villa with the cleaning crew and look into the matter. The cleaning crew spent additional time at the villa in order to make sure that our high standard of cleanliness is maintained and our guests are fully satisfied. Subsequently, we received an email from the client that they wanted financial compensation for additional cleaning which they have done themselves. A day later the client again requested further financial compensation for one day that the swimming pool was not clean to their satisfaction. The client measures the distance of the villa to the beach as 100 meters instead of 50 meters reported in the website, ignoring to include in his measurement the length of our villa which is 50 meters. The Marbella authorities spend significant resources every year in maintaining the beauty of this exclusive part of the Costa del Sol. Naturally, not all the costal areas are covered with fine sands and life guards which also contribute to the diverse and natural beauty of this coastal area. There are fine sandy beaches with life guards within 5 minutes walk in one direction and 10 minutes walk to another direction of the Villa. The price of Villas around us is over 2 million Euros. How this could be a shabby residential area? The guest showed unfairness by never mentioning in his review that he was provided financial compensation by us for possible shortcoming of our cleaning crew. Certainly the guest was more interested spending his time inspecting rather than enjoying vacation with his family. We are very proud of the accommodations which we offer in Puerto Banus area reflected by full occupancy of our accommodations year after year with many very satisfied returning guests. Golf: Andalucia is renowned for its top golf courses and the unique sunny and warm winter climate allows golf to be popular all year round. There are nearly 60 golf courses in Andalucia. By car you can reach Los Naranjos, Aloha, Las Brisas and La Quinta within 10 minutes. Torrequebrada, Mijas Golf and El Paraiso within 20 minutes, Sotogrande and Valderrama, (Ryder Cup - 1997, 1999 World Championships) within 40 minutes. There are approximately 20 other golf courses on the Costa del Sol within a 30 minute drive.